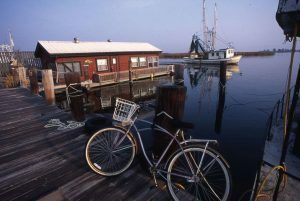 Apalachicola or “Apalach“, as it is known by locals, is far from a typical tourist town. Established in 1831, it was once the third largest port on the Gulf of Mexico. Wide, tree lined streets are still graced by picturesque homes from the nineteenth and twentieth century that show the wealth and craftsmanship of its early days. Apalachicola has over 900 historic homes and buildings listed in its extensive National Register District and it was selected as one of the nation’s Dozen Distinctive Destinations in 2008 by the National Trust for Historic Preservation. Apalachicola is situated on the Apalachicola River and Bay. This basin encompasses what is considered one of the least polluted, most undeveloped, ecologically diverse systems left in the United States. The Apalachicola Estuarine Research Reserve (ANERR) oversees the health of this vast system. The ANERR is the second largest in the nation with over 246,000 acres under its protection. 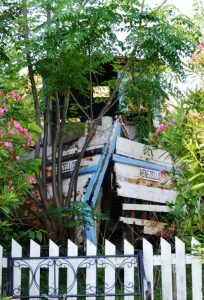 Apalachicola’s vibrant history and rich maritime culture can still be seen on its working waterfront. Buildings that once served as19th century ship’s chandleries, old net factories and a sponge warehouse now house a mix of eclectic and trendy shops, restaurants, galleries and meticulously restored hotels and B & B’s. These locally owned and operated businesses create a quaint and friendly atmosphere for visitors as well as local residents. A grand theater lies in the center of town. Restored in 1997, the Dixie Theatre hosts professional theater and music January through March. 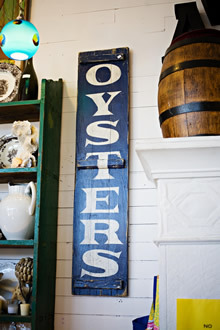 This unique city is noted for having some of the finest oysters, its bay oysters having a pure, mild, briny flavor that has been recognized by top chefs throughout the country. Apalachicola harvests over 90% of the oysters sold in Florida and 10% of the nationwide supply. Smaller open bay boats, moored or trailered each day, tong for oysters in the many shallow areas of Apalachicola Bay. Fishing vessels displaying proud patinas of years of service line the waterfront and regularly net fresh local shrimp and fish. A diverse selection of acclaimed restaurants feature fresh, local, daily harvested seafood.